Back Row (L to R): S. Whelan, L. O'Connor, L. Byrne, P. O'Riordan, P. Murphy, B. Hogan, S. Cleary, D. Griffin, T. Dunford, J. Kiely, R. Fives, (R. Ormonde - background, referee), K. Frost. Kneeling (L to R): K. Young, M. Coleman, J. Wright, Tomás Kiely, D. Hourigan, J. Regan, J. Kiely, D. McGovern, E. Griffin, P. Spillane, D. Kiely, S. Feehan. Seated (L to R): M. McGovern, T. 'Cub' Kiely, P. Byrne, M. Collins. 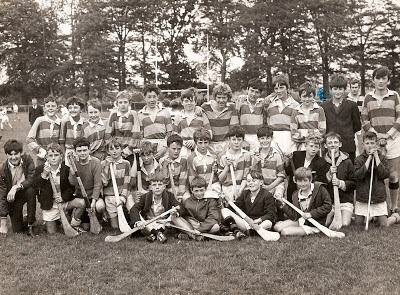 This week's photo shows the Abbeyside U14 team that won the first Western Hurling Championship held at this grade in 1970. 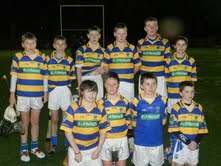 The young boys narrowly defeated Tallow by 3-2 to 2-3 at Lismore in the final. A free trip to Croke Park was an added bonus to the divisional title. Disappointingly, a 2-2 to 0-3 loss to Stradbally in the Western Football Final denied them the double. CLG Dún na Mainistreach / Baile na Cúirte would like to wish all our members and supporters at home and abroad a very happy Christmas and all the best for 2013. Back Row (L to R): John Gorman, Richie Ryan, Eoin Enright, James O'Mahony, John Phelan, Shane Briggs, Stephen Enright, Seán O'Hare, Gavin Breen, Gary Hurney, Patrick Hurney, Patrick Lynch, Eoin Brackett, Simon Hanrahan, Laurence Hurney. Front Row (L to R): Declan Enright, Declan Fives, Brendan Walsh, Mark Gorman, Tiernan Murray, Mark Ferncombe, John Kindregan, Richie Foley, Joey Mullen, John Hurney (Capt. ), Jonathan Moore, Mark Fives, John Foley. This week's photo features the Ballinacourty panel that captured the County Senior Football title in 2007. A hard fought 3-4 to 1-7 victory saw the club win its fourth championship, the first in 26 years. This year also saw the club reach its first Munster Club Senior Football Final. Following a 2-6 to 0-8 semi-final win over Kerry side Kilcummin, the boys were narrowly defeated, 1-10 to 1-7, by Cork kingpins Nemo Rangers in the final on a rain-lashed and wind-swept December day in Fitzgerald Stadium, Killarney. Listed below are the prizewinners in our Christmas Raffle which took place on Friday, 21st December in Minnies Bar. We would like to thank everyone who purchased tickets for the draw. Your support is greatly appreciated. Our popular Jack the Joker Fundraiser will continue this Sunday night in Kennedy’s Live at 9:30pm where the Jackpot will be €5,910 as on Sunday night Frank Sweeney was drawn out of the drum but did not find the Joker, however he did win €50, while Roisin Briggs and Kitty Farrell won €25. We appeal to all our supporters to continue purchasing the tickets as the funds raised will go towards our ongoing development works at the club grounds. It would be fair to say that ‘The Brawl in The Hall’ which took place on Saturday night last in Dungarvan Sports Centre exceeded all of our expectations such was its success. There was a bumper crowd present and all agreed that the night was a fantastic success with excellent entertainment on offer. We would like to thank all those who turned up on the night which not only made it a profitable night for both clubs but which helped to create the electric atmosphere in the hall. A big thanks to all the local businesses who gave such generous sponsorship especially in these difficult times. We would like to thank our friends in the Brickey Rangers as they were a pleasure to work with in the months leading up to the big night and we look forward to working with them again in the future, even if they did claim victory on the night!! We must thank the members of our own club especially Bernard Gorman and his group of diligent workers who ensured everything was in place to make the night a success. The staff at the Sports Centre were extremely helpful to both clubs and we thank them for this and also thanks to the staff of Minnies Bar for running the bar on the night. Finally we must give a massive thanks to the most important people on the night, the brave men and women who stepped into the ring to help support the club. This was a fantastic example of true club spirit and we hope that there weren’t too many bruised ribs or black eyes on display this week. If I have left anybody out here I truly apologise and once again we thank anybody who helped make the night a great success. Our Bingo continues this Sunday night in the CBS Hall where the jackpot will be at €550. Following on from the great success of last year’s golf outing we are holding another outing this year in The Gold Coast Golf Club on Saturday December 29th. Like last year this event is open to all members of the club and you needn’t be an experienced golfer to partake in the vent as the teams will be picked to ensure there is a balance of seasoned golfers and absolute beginners on each team. All those who took part last year enjoyed it thoroughly and places for this year’s event are being snapped up quickly. Anybody interested in taking part should contact Colm O’Hare to book their place. On behalf of all in the club we would like to send Seasons Greetings to all of our members and supporters especially those of you who may not be able to make it home to Abbeyside for Christmas. We would also like to thank the editor and staff of the Dungarvan Leader and Dungarvan Observer for all their help during the year and wish them all a very merry Christmas. Nollaig Shona agus Athbhliain faoi mhaise daoibhse go leir. Mentors are requested for underage teams for the coming year 2013. Any interested parties are asked to contact Carmel Power on 0872598923 or 05844586 or email carmelhennebry@gmail.com before the 31st December. From January 1st 2013, all players playing in all grades up to and including minors are required to wear a mouthguard in all football games and training sessions. It will be a matter for the club to ensure this rule is adhered to at all training sessions. Players and coaches should note that players will not be insured under the player injury scheme if they are not wearing a mouthguard. Therefore as a club we are obliged to enforce this rule at all training sessions. From all in the juvenile section off our club may we take this opportunity to wish all our young players and their families a very happy Christmas and a peaceful New Year. From all in the camogie club, we wish all our girls and their families a very happy Christmas and all the best for 2013. 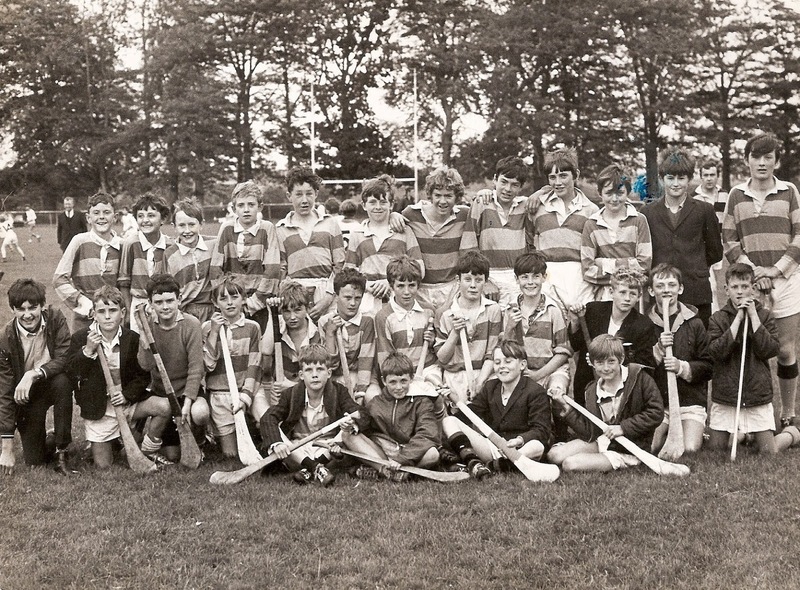 On this day 55 years ago, 15th December 1957, Abbeyside played in its second ever County Senior Hurling Final against Mount Sion at Fraher Field. This week's photo shows Jack and Ben O'Donovan with the jersey worn by their grandfather, Noel McGovern, on the day. Although Abbeyside were defeated 2-10 to 1-2, there was great praise for Noel who nullified the threat posed by the great Frankie Walsh, restricting him to just one point, that being the final score of the game. Our popular Jack the Joker Fundraiser will continue this Sunday night in Kennedy’s Live at 9:30pm where the Jackpot will be €5,608 as on Sunday night Billy and Catherine were drawn out of the drum but did not find the Joker, however they do win €50, while Roisin Briggs and Maurice O’Donnell won €25. We appeal to all our supporters to continue purchasing the tickets as the funds raised will go towards our ongoing development works at the club grounds. It’s almost here!! Saturday night in the Sports Centre sees the culmination of all the hard work by our brave boxers as they face the best Brickey Rangers has to offer. The action begins at 8:00pm. Tickets are now sold out and we wish all our boxers the very best of luck and hope all our supporters enjoy a wonderful evening. We would also like to thank our many sponsors who have been so generous especially in these difficult economic times. Here are the final profiles of our boxers who will be taking to the ring on Saturday night. Comments on the Event: You toughen up after the first punch!! Position: Keeping Foley company on the bench!!! There was a very good turnout for our AGM which took place on Saturday night last. The meeting began with a silent prayer for all those who have passed away during the year after which Packie Hurney presented the Financial Statement to the meeting. This showed the club to be in a good financial position despite the extensive development work that had taken place in the club in recent years. Bernard Shields’ excellent Secretary’s Report gave a comprehensive review of all club activities throughout the year with some very interesting suggestions for the future of the club. In his Chairman’s address Tony Mansfield thanked all those who worked for the club during the year especially those involved in our two main fundraisers, The Club Bingo and The Joker, as without the work of these people the club would not be able to exist. Tony also praised all those who give so much of their time to our Juvenile Section as this is the work which will ensure that our club will continue to grow and develop in the years ahead. Finally Tony paid tribute to all the workers involved in the development work in the club throughout the year as this voluntary labour has given the club facilities which we can be proud of. The election of officers and committee then took place. Our Bingo continues this Sunday night in the CBS Hall where the jackpot will be at €500. There will be a meeting of the club committee in the club grounds at 8pm on Monday December 17th. Managers / mentors are requested for underage teams for the coming year 2013. Any interested parties are asked to contact Carmel Power on 0872598923 or 05844586 or email carmelhennebry@gmail.com before the 31st December. 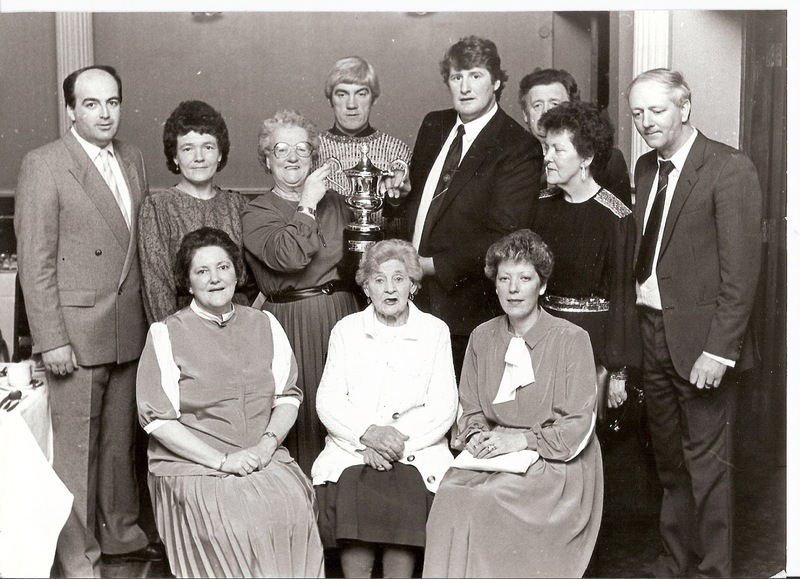 Back Row (L to R): Niall Dennehy, Mary McGovern, Jane Langan, Pat Moore, Greg Fives, Liam O'Dea, June McShane, Liam Enright. Front Row (L to R): Mary Rossiter, Biddy Flynn, Betty Tutty. This week's photo brings us back to the late 1980s and the presentation of the Langan Cup by the Langan family in memory of former chairman and selector Paddy Langan who served the club with distinction for very many years. The cup is played for on an annual basis at the club grounds. Our popular Jack the Joker Fundraiser will continue this Sunday night in Kennedy’s Live at 9:30pm where the Jackpot will be €5,368 as on Sunday night Louise O’Donnell was drawn out of the drum but did not find the Joker, however she does win €50, while Jim Egan and Martin Lavan won €25. We appeal to all our supporters to continue purchasing the tickets as the funds raised will go towards our ongoing development works at the club grounds. There’s less than two weeks to go to the club’s unique boxing fundraiser in connection with Brickey Rangers GAA Club. The event will take place on Saturday, 15th December in Dungarvan Sports Centre. Tickets priced at €10 can be purchased from any committee member. Our boxers are training two nights a week with another session on Saturday mornings so they are sure to be in prime shape for the big night. Here we have profiles on some of the brave men who will be entering the ring on the night. Comments on the Event: A cheeky dig before we start and we’ll take it from there!! Comments on the Event: Sober going in, punch drunk coming out!! Comments on the Event: Let’s all put on a great show for the kids!!! Notification for the upcoming AGM, which will take place on Saturday, December 8th at 8pm in Abbeyside School, the agenda for the meeting and nominations for officer posts have been delivered to all members. Any member who supplied an email address on their membership form earlier in the year will have been notified by email. If any member failed to receive notification, please contact the club secretary to obtain same. Our Bingo continues this Sunday night in the CBS Hall where the jackpot will be at €450. Anybody who is interested in being considered for a team manager position for any of our adult teams is asked to submit their name to the club secretary by Saturday December 8th. Indoor hurling continues on Friday evenings from 6 o clock in the Friary gym. The Club’s Annual General Meeting takes place on Saturday next, 8th December at 8:00pm in Scoil Mhuire, Abbeyside. In anticipation of this and to commemorate the 45th anniversary of the newly amalgamated Abbeyside / Ballinacourty GAA Club, we list the Officers and Committee Members for 1967. President: Fr. J. Roche, P.P. Membership for 1967 was set at £1. Our popular Jack the Joker Fundraiser will continue this Sunday night in Kennedy’s Live at 9:30pm where the Jackpot will be €5,100 as on Sunday night Geoff Collins was drawn out of the drum but did not find the Joker, however he does win €50, while Nicky Dwane and Michael Kiely won €25. We appeal to all our supporters to continue purchasing the tickets as the funds raised will go towards our ongoing development works at the club grounds. The countdown in on to the club’s unique boxing fundraiser in connection with Brickey Rangers GAA Club. The event will take place on Saturday, 15th December in Dungarvan Sports Centre. Tickets priced at €10 can be purchased from any committee member. Our boxers are training two nights a week with another session on Saturday mornings so they are sure to be in prime shape for the big night. Here we have profiles on some of the brave men who will be entering the ring on the night. Comments on the Event: A bit of craic!! There will be a meeting of the club committee this Thursday at 7:15pm in the club grounds. Our final action for the 2012 season was competing in the annual under 12 hurling tournament hosted by Carraigeen GAA in Kilkenny. This is a very well run tournament on an all-weather surface each weekend for October & November with all the top teams from Kilkenny and surrounding counties with some travelling from Dublin. Last Saturday evening we played in the final and played some superb hurling for the hour to retain the trophy again this year. Thanks to all the parents who travelled on the night. We would like to wish Meldan O’Dwyer a speedy recovery for a hand injury sustained on the night. Congratulations to the following players Daithi Brunnock, Sean Crotty & Tom Looby on winning the Board na Óg awards for last Saturday evening. Congratulations also to Mr Walsh and Scoil Mhuire on winning the primary school football county final last Tuesday. This was a great hard fought win for the boys. This is the 3rd consecutive year that the school has won this final. We offer our deepest sympathy to the family of Tommy Daly, Ballymarket who died this week. His grandson Sean is a member of our minor and U16 panel and his daughter Claire is former treasurer of the Camogie club. Ar dheis go raibh a hanam. 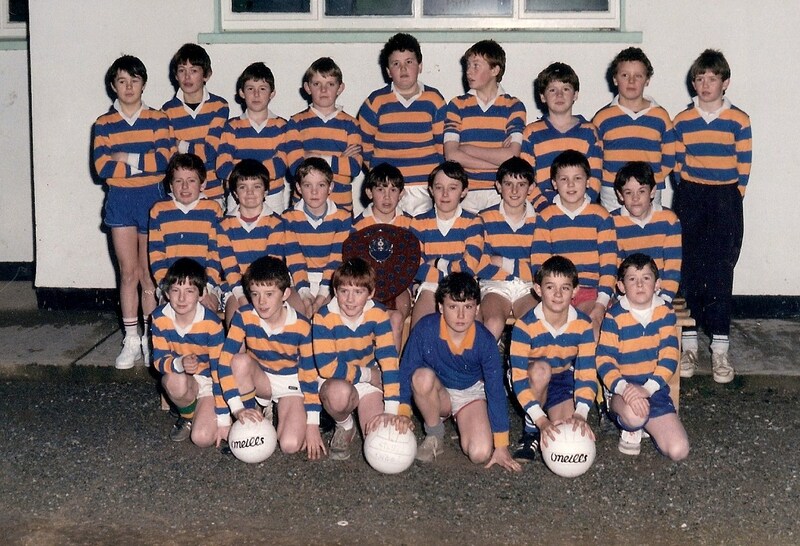 Back Row (L to R): Eoin Murray, Dwaine Moore, Gavin Breen, Declan O'Mahony, Patrick Power, Michael Sheehan, Paul O'Brien, Jason O'Donovan, Gavin Keane. Middle Row (L to R): Jonathan Moore, Michael Kelleher, Paudie Shields, Kieran Cunningham, Michael Enright, Brendan Cliffe, Willie Fennell, Brendan Flynn. Front Row (L to R): Alan Moore, Fergal Fraher, Michael Brett, Brian O'Donovan, Aidan Landers, Vincent Tobin. This week's photo shows the Abbeyside U12 team that captured the Western Football title after a 2-4 to 2-1 victory over Tallow at Lismore. 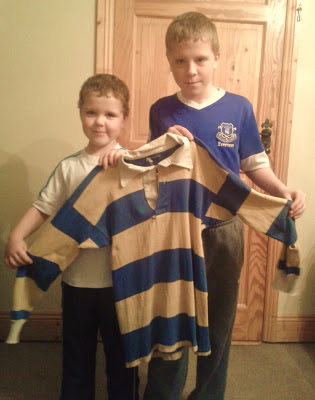 All underage football teams played as Abbeyside until the Club Constitution was altered in 2000. This marked the fourth occasion that the club won the divisional title. No county finals were played at U12 level at this time. Our popular Jack the Joker Fundraiser will continue this Sunday night in Kennedy’s Live at 9:30pm where the Jackpot will be €4,944 as on Sunday night Jim Egan was drawn out of the drum but did not find the Joker, however he does win €50, while Susan Kiely and Christy Dunford won €25. We appeal to all our supporters to continue purchasing the tickets as the funds raised will go towards our ongoing development works at the club grounds. Interests: Hurling; Avoiding being hit!!! Comments on the Event: Hit my man before he hits me – before the bell if possible!!! Comments on the Event: Can’t wait!! Comments on the Event: Anything for a night out!! Notification for the upcoming AGM which will take place on December 8th at 8pm in Abbeyside School has been delivered to all members. Any member who supplied an email address on their membership form earlier in the year will have been notified by email. If any member failed to receive notification, please contact the club secretary to obtain notification. This Sunday our club bingo will return to the CBS Hall after last Sunday’s very successful Monster Bingo in the Park Hotel and we would like to thank the management and staff of the hotel for all their help on the day. There will be a meeting of the club committee on Thursday, November 22nd at 8 pm in the club grounds.